Acting Interior Secretary David Bernhardt, who is expected to have a confirmation hearing before the U.S. Senate this month, is currently fighting a document request from House Natural Resources Committee Chairman Raúl Grijalva, who wants to see Bernhardt’s calendars. 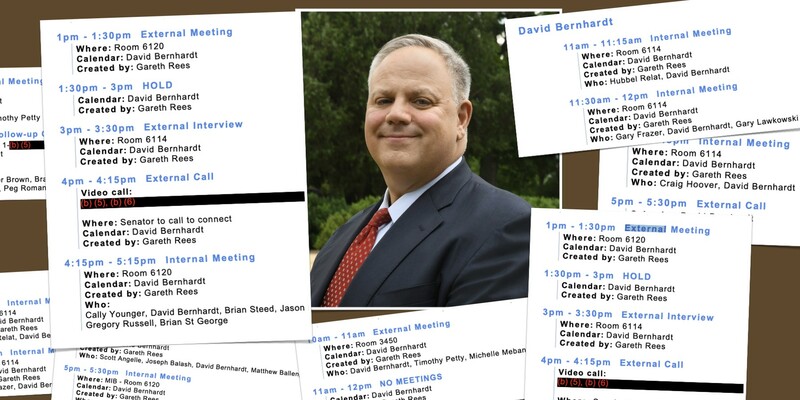 Bernhardt’s public calendars have been exceptionally vague, consisting largely of “external” and “internal” meetings, and omitting other meetings, including two with the president of the American Petroleum Institute. 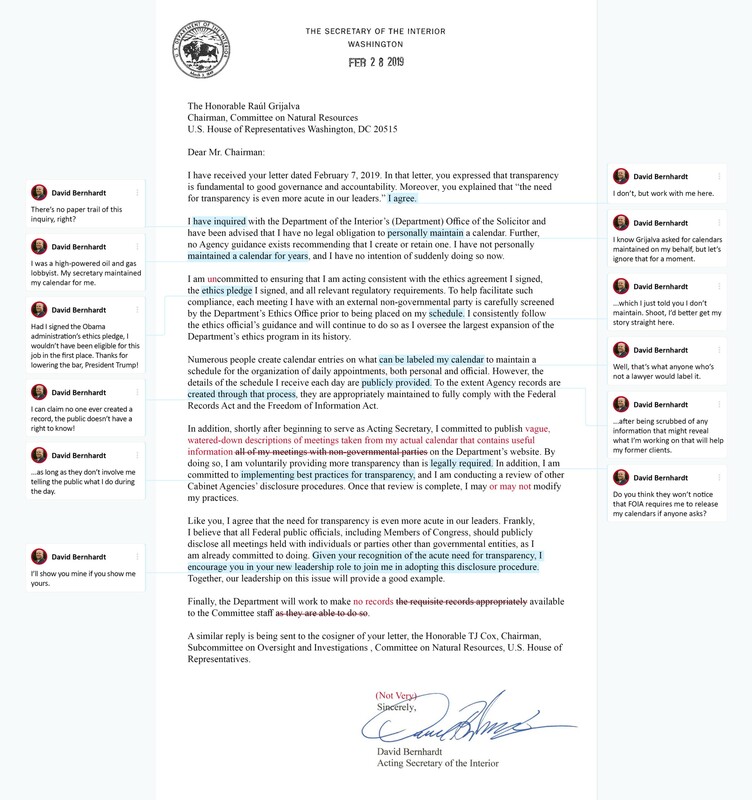 Rather than reveal who he meets with and what he’s working on to help his former clients, Bernhardt snarked back at Grijavla with a letter that talked a lot about transparency while actually doubling down on secrecy. The Center for Western Priorities has obtained an early draft* of that letter with comments and suggested changes from Bernhardt that reveal his true motives. *Not really. The letter is real. The comments and markup are not. CUMMINGS: Is the calendar for the Acting Secretary deleted at the end of each day, do you know that? SPECTOR: I don’t know that. CUMMINGS: Is it possible this is happening and you do not know about it? CUMMINGS: That is, the deletion of the calendars? The entries? SPECTOR: I have some familiarity with the issue that you’re raising, and understand that the solicitor’s office in the department is working with the records officer in the department to determine what’s occurred there, and whether it’s consistent. CUMMINGS: How long have you been in the position you’re in? SPECTOR: For two months sir. CUMMINGS: Has any Interior employee ever been tasked with re-creating the calendar of the acting secretary, by piecing together drafts of Google Documents, or using other records of meetings? SPECTOR: Not to my knowledge. CUMMINGS: Has any interior employee ever been told to stop re-creating the calendar of the acting secretary? SPECTOR: Again, not to my knowledge. Want more of this? Sign up for Look West to get daily public lands and energy news sent to your inbox, or subscribe to Go West, Young Podcast.